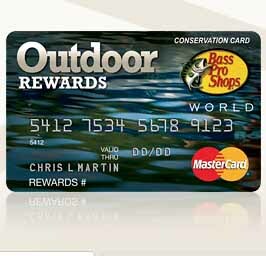 Cardholders get 5% rewards on qualifying purchases made at Bass Pro Shops with a World MasterCard credit card or 3% with a Platinum Plus credit card. Purchases elsewhere earn 1% rewards. Each purchase also helps to support the National Fish and Wildlife Foundation. Cardholders enjoy 0% introductory APR for first 12 months. No email, tweet to @BofA_Help for assistance.